Navigate cultural differences in meeting styles and gift-givingThe fun and easy way to say and do the right thing in all business situationsWant to be on your best business behavior? 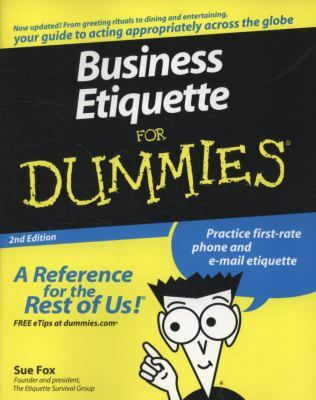 This friendly, authoritative guide shows you how to develop good etiquette on the job and successfully navigate today's culturally diverse business environment. You get savvy tips for dressing the part, making polite conversation, minding your manners at meetings and meals, behaving at off-site events, handling ethical dilemmas, and conducting international business.Discover how to:Make a great first impressionPractice proper online etiquetteBuild your verbal and written skillsDeal with difficult personalitiesBecome a well-mannered travelerFox, Sue is the author of 'Business Etiquette For Dummies', published 2008 under ISBN 9780470147092 and ISBN 0470147091. Loading marketplace prices 120 copies from $1.98 How does the rental process work?